I met Sarah at Bountiful Lake this morning for a swim. She had never seen the fish jumping out of the water in the morning, and thought it was pretty cool. I was going to do laps around the edge of the lake, but there were a handful of fishers on the shore. Instead I decided to do "big loops" like I did with Lisa last week. Sarah's thermometer read 64 degrees, but it felt much warmer than when I was here last week and the temperature was the same. Maybe it felt warmer because the air temperature was so warm this morning. Visibility was about two feet and the water was glass. I took it easy for the first two laps. On the third lap, I decided to switch it up a bit and swim 100 strokes easy / 100 strokes fast all the way around. 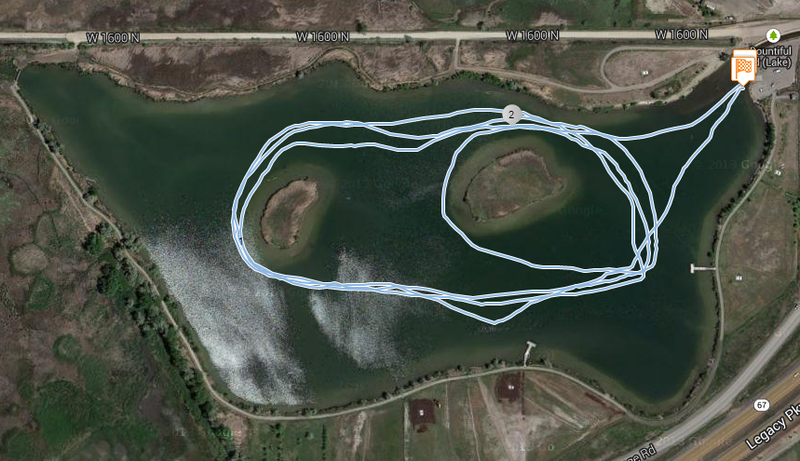 After that, I added one loop around the first island, just to be sure that I got a solid two miles in. 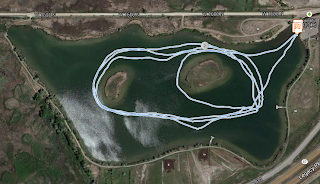 I've been thinking a lot about the 11-mile Dam 2 Dam swim coming up in August. I need to get at least one long (6-ish miles) open water swim in before then. Do you feel that the water is fairly clean in Bountiful Lake? I've heard mixed reviews, but those were posts from a few years back. Thanks. I would stay away in late July and August and also after a big rain storm. Other than that, its not a bad place to swim. Visibility is only a couple feet. I have never had any problems swimming there.